I stuck to the usual royalty-free stock photo sites for a while, until I realized most of it is business related and they all stock the same boring stuff. Then I discovered an amazing photo depository of work by photographers who allow use of their work without conditions, not even attribution. It’s called Unsplash.com, and I’m a frequent flyer on the site. Just for the record, I attribute the artist and source anyway. How do I handle searching for an artist who wasn’t cited? Some are easy, like the one below, “Portal of my Dreams” by Kalim Galal via DeviantArt, which I found on Pinterest. Thankfully, it had the artist’s signature. I did a quick search on the name, and found Mr. Galal on DeviantArt. Love this graphic. Invoked an idea for a new story. Others were not so easy, and needed a bit of sleuthing. Once I found a haunting piece that inspired a new antagonist from a character Pinterest board I follow. Unfortunately, the link went to someone else’s blog, who found it from who-knows-where. Since artwork and photographs are usually found on the internet, I discovered Google Images has a reverse Search by Image tab. I selected the little camera icon, chose “Upload an Image”, pasted the picture file, and voila – up came “Mi’kaii” by artist Benita Winckler on CGSociety. Here’s another one that caught my eye as a picture for a blog article (like this one). It’s popped up on Pinterest boards like crazy. Quick flick of the image search, and Google’s best guess is ….. Pink Floyd Greatest Hits Cover. What the … ? I don’t remember this cover. When I clicked forward on search results, and finally stumbled on photographer Bryan Allen, whose work is also found on FineArtAmerica. I loved this next example of a dark witch, another candidate for the antagonist I mentioned. Plugged it into image search, and …… huh? It’s been pinned and used multiple times, and is in the top list for Pinterest’s re-pinned stats. When Google’s best guess for the image was black magic witch makeup, it smelled like a graphic found in wallpaper sites – the kind of places you find screensavers and posters. The search eventually ended up at Dark Walls, a site specializing in Goth. It appears to be a free download, but I’m always skeptical. Oh well, I’ll admire it, but won’t make my list of potential book covers anytime soon. Oh, and a word of caution, make sure your malware program is up to date. Some of the URL addresses may take you places you don’t want to go. Study the link before you select. Much of where it leads is often in the address, and obvious that it won’t offer artist identification. Finally, there are times when you just hit a wall. Example in point, a little girl gazing at the full moon from her bedroom window, which left me in awe of its simple yet powerful image. The best guesses resulted with – full moon & see. This graphic has been pinned, posted, and used so many times, search results go on for pages. Any luck with identifying the artist? Nada, which is a shame since it appears to be so popular. I theorize it’s an old piece which made the wallpaper download circuit, ending up in the internet desert of lost artists. Now, if you’re thinking it’s all a lot of work and who cares anyway, just imagine yourself as an artist who put hours, days, maybe weeks, into creating that perfect picture or illustration. Imagine seeing your work headlining an article with nary a mention of who created that perfect image. I’d be pissed. So would you, I’ll venture. Writers, especially Indie authors, are very familiar with the potential for piracy. The same goes for photographers, graphic artists, and illustrators. There is more to it than potential copyright infringement. It’s just plain courtesy. I’ll leave you to ponder on that thought with a pleasant image from an enhanced photograph I found a couple years ago. This picture spawned many inspirational blog articles and posts. Who created this amazing graphic? I have no idea, and I’m not the first pinner to ask if anyone knew who made it. Closest I got with search was a wallpaper site in a foreign country without attribution (don’t go there). Yet another artistic work lost in the twilight zone. If anyone knows who made this, please let me know. If you have alternative methods for identifying artwork or photographs by the image, I’d love to hear from you. 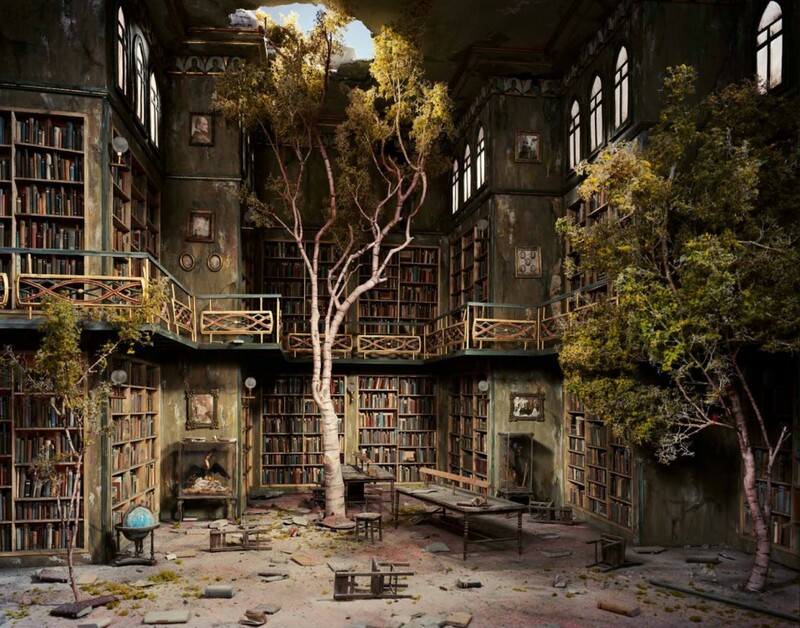 That header graphic on my WordPress blog – the one of a tree growing through the roof of a dilapidated library? Found the amazing Lori Nix and her unique diorama artwork. I contacted her for permission, and she graciously gave it. Feel free to browse my Pinterest Boards, specifically Searching for Light, Concept Art, Characters, and Dystopian. Many of the pins were obtained from other pinners, that led to other pinners or bloggers. It’s part of the daisy chain of pinning. I’m just as guilty as everyone else of pinning without checking, but it’s nice to know if I want to use the graphic in a tweet or blog article, there’s a tool to help me find the artist …… or at least some them anyway. This is actually why I started illustrating my own blog posts, so I wouldn’t have to worry about other people getting mad at me for stealing their work. Now I’m sort of on the other side of the issue. But people have been pretty good asking for permission to use my stuff and about attributing my work back to me. At least I haven’t run into any problems yet. Do you have folder of your work, maybe on a Pinterest Board or something. I’ve seen your art on blogs, but I’d love to see the collection if you have one. I’ve never put anything like that together, unfortunately. I should probably have a gallery or something on my blog for people to scroll through. The thing is, I honestly started drawing my own stuff solely because I was worried about the copyright issues of using art or photos from other people. So I never had any real plan for organizing my work, and at this point it’s kind of a daunting project.